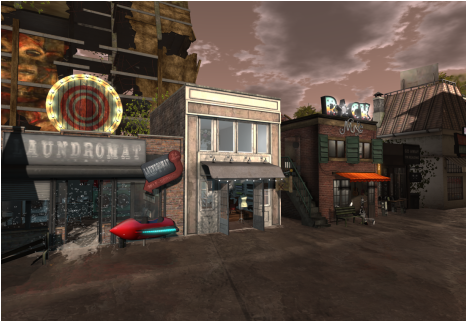 Our vision has come to (virtual) fruition in a small corner of second life called Excalibur Serendipity which houses our first Climate Fiction themed environment built by Flit Ulrik, Dylain Nikita, Epimitheus Resident, Mollywollidoodle Resident and Jordy Parkin. Our Sim is completely flooded by the water creating a never-before-seen environment to photograph, role play or just hang out with friends. Inspired by the Canadian author Margret Atwood’s MaddAdam series : Oryx & Crake, The Year of the Flood and MaddAdam. We wanted to take a probable ‘end’ for a new twist to Post Apocalyptic Speculative Fiction combining the concepts of Tank Girl, Mad Max and Waterworld alike. With a lack of the natural resources needed to sustain life itself, how will the survivors learn to filter water, find rich soil and keep their socks dry? 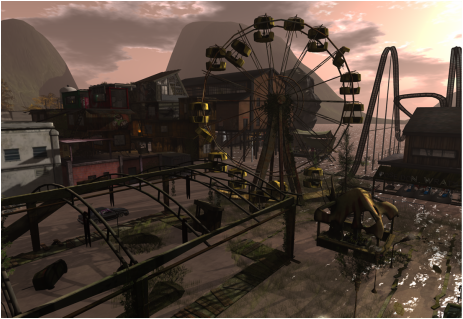 We invite you to become part of what we’d like to think you’ve never experienced before in SL. Come explore the three corners of the new world Dystopia, The Slums & Carnage City.